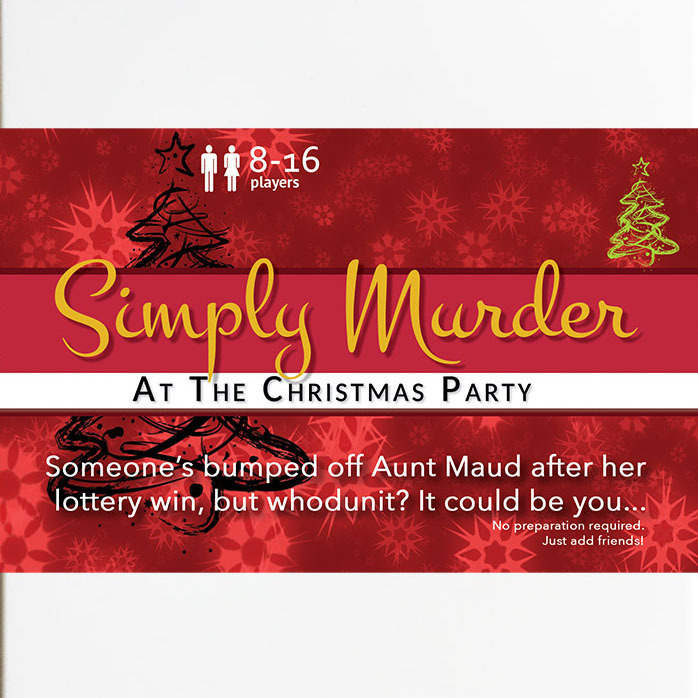 Simply Murder at the Christmas Party [Download] - �.99 delivered. Aunt Maud's won big on the lottery and she's invited her nearest and dearest to a lavish Christmas retreat at an exclusive country manor. But that's where Maud's luck runs out. Somebody's not happy with their present and Maud takes a face dive into the Christmas turkey. Who killed her? It could be you! No script, more freedom! Use your characters key facts and background info to improvise your role! No preparation required - just add friends! See the Murder Mystery Party website for full character bios and costume suggestions! Simply Murder takes the hassle out of hosting with a pick-up-and-play kit that needs no preparation. You don抰 have to send out invitations or dress up (unless you want to). Just hand out the roles and let the fun begin! Each player is given a character sheet containing a scripted introduction and key facts - there aren抰 any scripted questions or answers, leaving you completely free to improvise your role (acting tips are included)! Audio narration from Inspector Basset drives the game forward over three rounds, so you can play along with your friends - even the host doesn抰 know whodunit! * Play with ANY combination of 8-16 guests. No-one is 'bolted on', everyone's a suspect. Note: Download instructions are delivered instantly by email. You will need an internet connection and printer to download and print this game. RECOMMENDED FOR AGES 14 AND UP (or younger at parents discretion). This game is also available as a ready-to-play boxed version - click here to view. Very much enjoyed the game. We played on our New Year party. It was a lot of fun and costumes went very well. Definitely going to play more.